If you have a craving for french fries, fries cooked in canola oil are a better choice than french fries cooked in partially hydrogenated oils, such as soybean, cottonseed or corn oils. If you make your own fries at home, using nothing but canola oil and potatoes. French fries can supply adequate nutrition if you eat them in moderate quantities; both potatoes and oils of any kind can be high in calories. French fries served in restaurants often have a number of added ingredients that can make them an unhealthy choice compared to homemade french fries. Canola oil is an unsaturated fat that's high in omega-3 fatty acids, which have heart-protective benefits, such as lowering triglyceride and total cholesterol levels and reducing platelet aggregation, which can cause blood clots to form. Only flaxseed oil contains more omega-3 fatty acids than canola oil. All oils contain a combination of omega-3 and omega-6 fatty acids; oils with a higher ratio of omega-3 to omega-6 fatty acids are considered the healthiest. Flaxseed oil has a ratio of 1:0.3, containing more omega-3 than omega-6, while canola oil has a ratio of 1:2, containing more omega-6 than omega-3. When heated above 120 degrees Fahrenheit to fry potatoes, some of the fatty acids in canola oil turn to trans fats, according to pediatrician and author William Sears, M.D. Trans fats, the worst type of fat for raising your total cholesterol and lowering low-density lipoprotein, the "good" type of cholesterol, can also increase your risk of developing atherosclerosis, a buildup of plaque in blood vessels. Choosing organic canola oil eliminates the pesticides that can accumulate in rapeseed, used to make canola oil, Sears states. A 6-oz. serving of french fries cooked with canola oil that contains no additional ingredients supplies 447 calories when served by Washington University St. Louis' Dining Service. Of those, 48 g come from carbohydrate, which equals 16 percent of your daily carbohydrate allowance. One serving also supplies 27.8 g or 43 percent of your daily fat intake, with 2.1 g from saturated fat. One serving also contains 4 g of protein. Canola oil is a better choice for frying potatoes than oils, such as vegetable oil, which is a blend of different types of oils or cottonseed oil, which is higher in saturated fats and is also likely to be contaminated with pesticides, since cotton crops are heavily sprayed with pesticides. Avoid oils that are partially hydrogenated, which contain larger amounts of trans fats. Can I Broil Potatoes With Olive Oil? 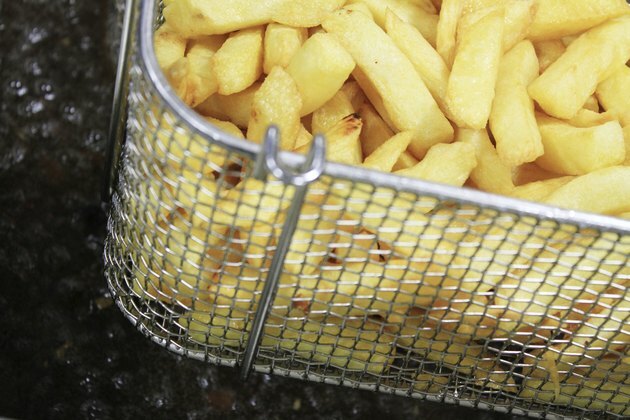 Is Vegetable Oil or Olive Oil Better to Fry French Fries With?